Judy Watson Napangardi was around 1935 on Mt Doreen Station, northwest of Alice Springs, between the Gibson and Tanami Deserts. Judy grew up living the traditional life of a Warlpiri girl, travelling throughout her tribe's ancestral lands, in particular around the Mina Mina area. Judy Watson took up painting in 1986, initially being taught by her elder sister, noted artist Maggie Watson Napangardi. Over time Judy and Maggie moved from the use of discreet dots in their paintings to a distinctive drag and dot technique where the brush does not leave the canvas as they paint. Some say that this technique mimics the style of dancing typical of Warlpiri women in which they drag their feet through the dust. Typical of many Warlpiri artists, Judy uses a vibrant array of colours in her paintings and amazingly achieves a cohesiveness of expression that defies the broad colour spectrum used. Since Maggie passed away, Judy took over responsibility for the dreamings surrounding the important women's ceremonial sites at Mina Mina. Judy continually returns to the themes from these dreamings and often represents multiple themes on one canvas. 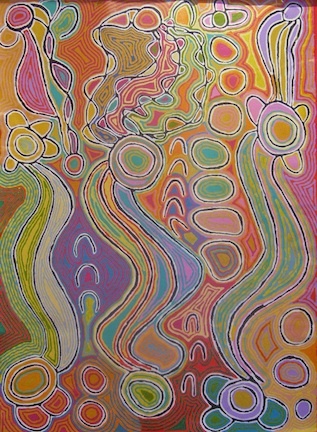 Most commonly, she now paints images associated with snake vine, native truffle (or bush mushroom as Judy calls it), desert oak and sites where the Napangardi and Napanangka women gather. Judy Watson Napangardi is presently on the board of Warlurkurlangu Artists, the Warlpiri community art body based in Yuendumu where Judy lives with a number of her 10 children.